If you were to pole the average 8 year old what they would like for breakfast on a Saturday morning, the answers that you may get could be cereal, french toast, pancakes...you know, the standards...but if you were to pole our 8 year old, the answer would be Eggs Benedict. This 8 year old is AWESOME! It all started about a year ago when I wanted to try making this recipe for a weekend brunch when Eric's mom was coming over. I read a solid recipe (same one I use today) and went crazy in the kitchen. One thing that I learned is that you can truly make a mess and use lots of dishes to make this recipe work, but it is SOOOO worth it. The first time I start making this breakfast, in the back of my head, I know that if it fails with the little one, at least there is English muffins and cereal. It was the total opposite of a fail - she LOVED it - and I couldn't be happier about this. Now, when we go to restaurants for brunch, it's what she orders...or it's what I order and she finishes half of it. It's also what she recommends for weekend breakfasts when we have family discussions on meals for the week. It's what we have made when Eric's family has been over for brunches, it is what we make when we visit my family...needless to say, we like Eggs Benedict. I wanted to share this recipe today because it relates to so many family memories for me and this is a landmark post for me---100 blog posts!!! Quite the feat, if I do say so myself. I've put a lot of time into this part of my life. Not as much as would like lately, but over the last three years, it has been a part of me and I'm happy to have been able to share with you. I look forward to the next 100 posts to share! Thank you to everyone who have supported and encouraging me to keep experimenting!!! Place slice ham in small pan with water & liquid smoke. Warm over low burner while making the rest of the meal. Start the Hollandaise sauce below. Poaching eggs can be done a variety of ways - there are poach pans you can buy, individual egg rings and poachers, silicone poach pads that go in the microwave, but I did it the old fashioned way - in a skillet with simmering water and a little vinegar. Crack one egg at a time in a small ramekin - preferably one with a pour spout or corner with the same effect. Place about a 1/2 inch of water and 1 tsp vinegar (I used the cider because that is what was in the Hollandaise also) in non-stick skillet and bring a simmer on the stove. When you start to see the bubbles form, gently take a spoon and swirl it around the water to create the whirlpool effect. Pour the egg into the center of the whirlpool to help keep the whites and yolk together. The first egg will be the toughest, but when that is able to move from it's spot, you can create other whirl pool effects throughout the skillet and place more cracked eggs in to poach. They are done when it is to your liking...generally when the white is solid in color and the yolk no longer looks too runny. When Hollandaise Sauce, poached eggs are done, toast the English muffins and place the 2 halves up on a plate. 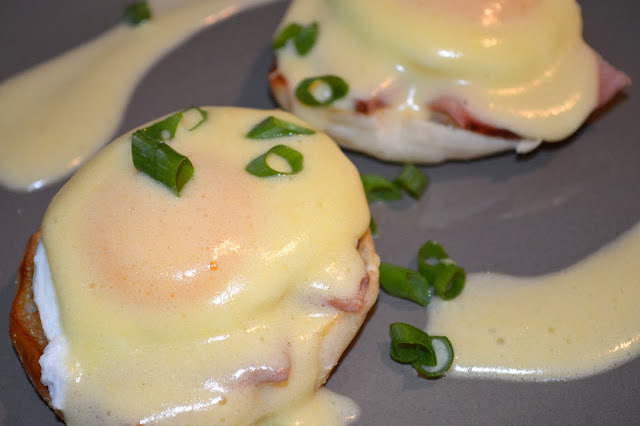 Arrange the ham on the English Muffins, a poached egg on each and drizzle with as much Hollandaise as you would like. Garnish with parsley, chive or green onion if you would like. ENJOY - They are DELICIOUS!!! Notes: They will stick to the bottom at first. Give them time to cook together before trying to move the first few eggs. I have put up to 5 eggs in a 12" skillet and been successful. Not all the whites will stay together - periodically throughout the cooking, I will take a slotted spoon and remove misc whites that are floating through the water. Poaching eggs is not an art or science, but like anything, just takes a little practice and trial and error. Prep - separate 4 yolks and melt butter. Heat vinegar and peppercorns on the stove and reduce until almost dry, almost 5 minutes. Add water to vinegar mixture and strain into a stainless steel or glass bowl. 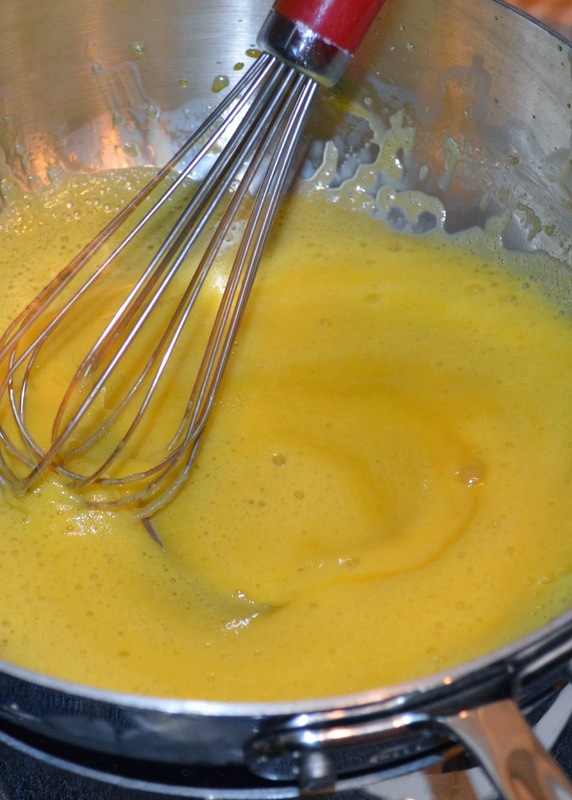 Place bowl over pot of simmering water, add egg yolks and whisk consistently until the yolks triple in size. This should be done by hand whisking - an electronic whisk will put too much air in the mixture and it will no longer be creamy. Remove bowl from the water and place on a towel on the counter to keep steady. Slowly ladle in the ware butter, continuing to whisk. Adding the butter slowly will thicken the sauce. 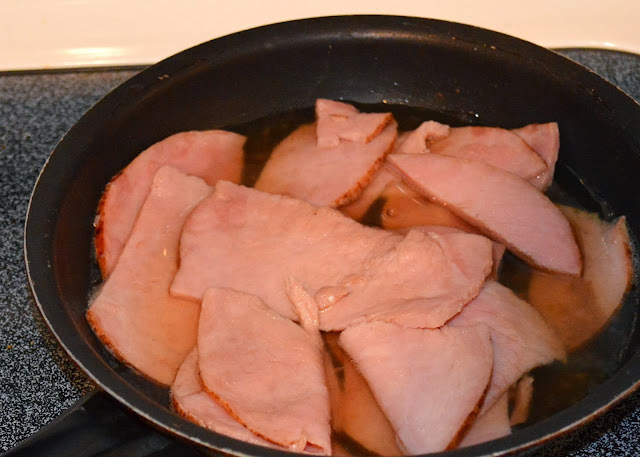 If the sauce becomes too thick, add lemon juice and/or water to thin as needed. Season the Hollandaise with lemon juice, salt, pepper and cayenne to your taste. **Hollandaise Sauce recipe from The Culinary Institute of America Cookbook.